It’s another hot one here and I am looking to make no bake, easy, healthy recipes and today I have a good one for you. 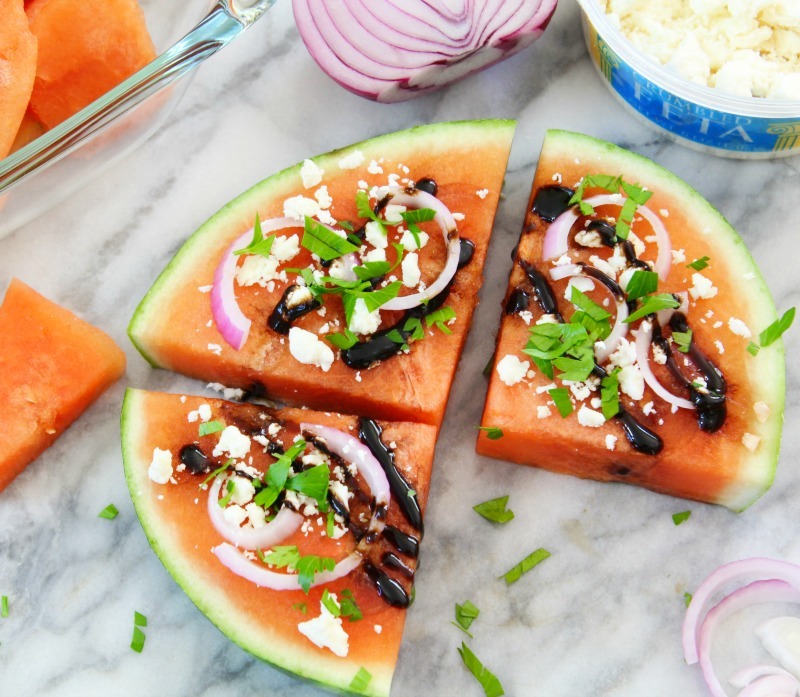 It’s my Mediterranean Watermelon Pizza. It’s sweet, savory and really has a nice Greek flavor. When I took a bite, I knew I had to share it with you. It is out of this world good. This pizza is also so easy to make. It took the longest cutting the watermelon. I just love watermelon. I picked this Irish Watermelon from Target. It’s nice and round and of course I didn’t cut it straight. I am so horrible at making a straight cut. 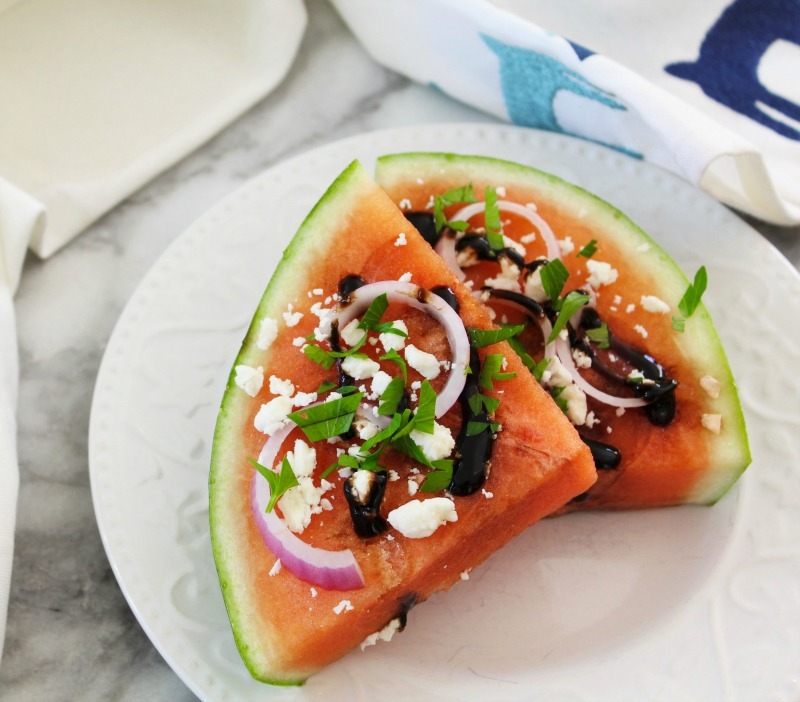 Also, it is best to use a seedless watermelon for the recipe. The first thing I did was cut the watermelon in half, then cut into a 1 1/2″ thick slice. To look like a pizza. I than cut the pizza into 4 slices. Top the pizza with feta cheese, and thinly sliced red onion. The last toppings is a little bit of Balsamic Glaze and fresh chopped parsley. It not only tastes good, but it is so pretty too. For the balsamic glaze, I used Trader Joe’s brand, but you could make your own. Such a lovely, simple dish that is perfect for serving at parties. It will pleasantly surprise everyone. Watermelon is good on its own, but add a few friends and you have a party. You can serve this on a pretty platter, or have the ingredients on their own, so people can top there pizza with the ingredients. 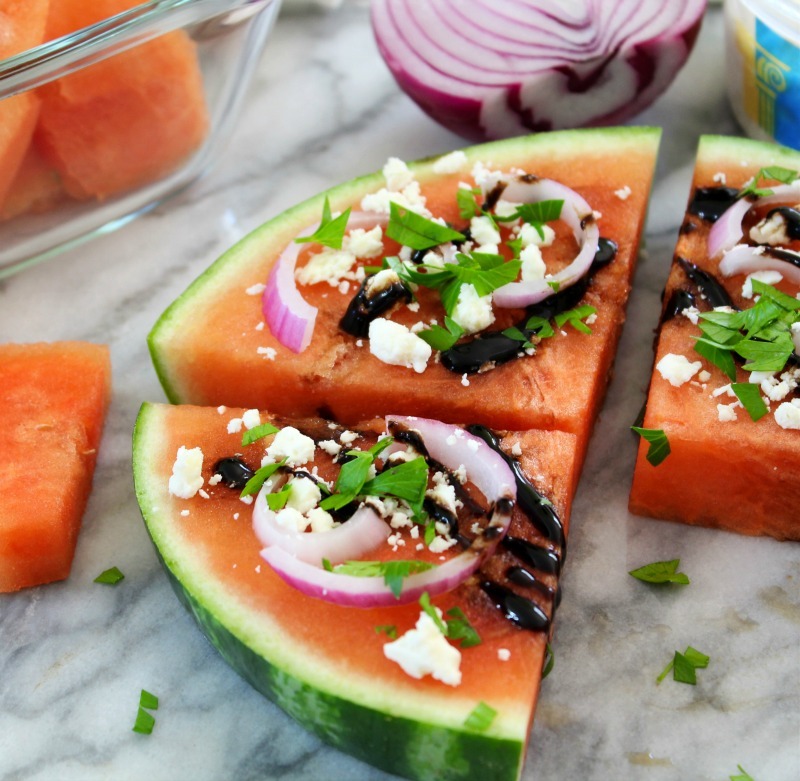 The combination is sweet from the watermelon, and the feta cheese adds a nice salty flavor and the onions add a crunch and the savory taste. 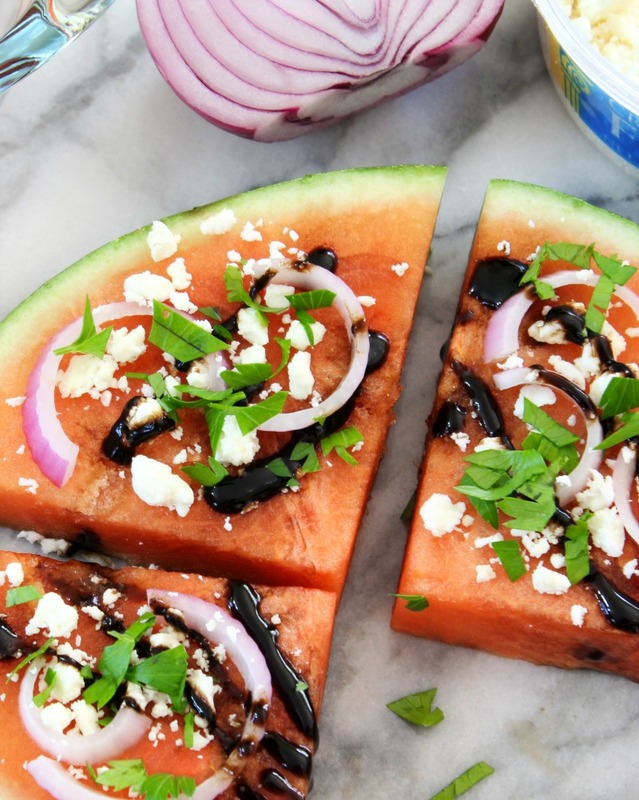 Of course the balsamic glaze just brings it all together with a tart flavor. I am not one for eating raw onions, but I have to admit, they are simply perfect on watermelon. A little bit goes a long way. 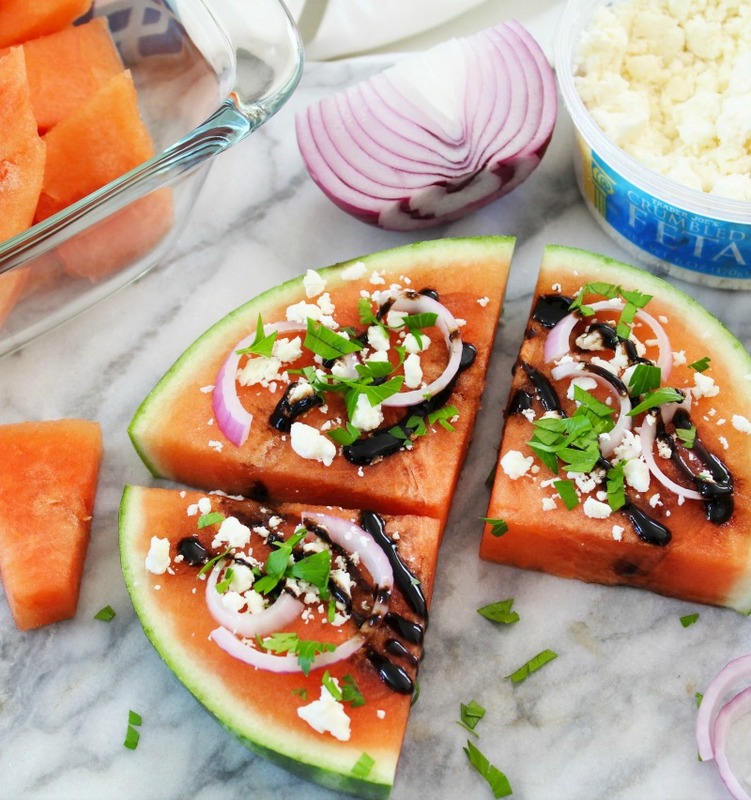 A sweet and savory watermelon topped with salty feta, savory onion and topped with a tart balsamic glaze and sprinkled with a little bit of parsley. 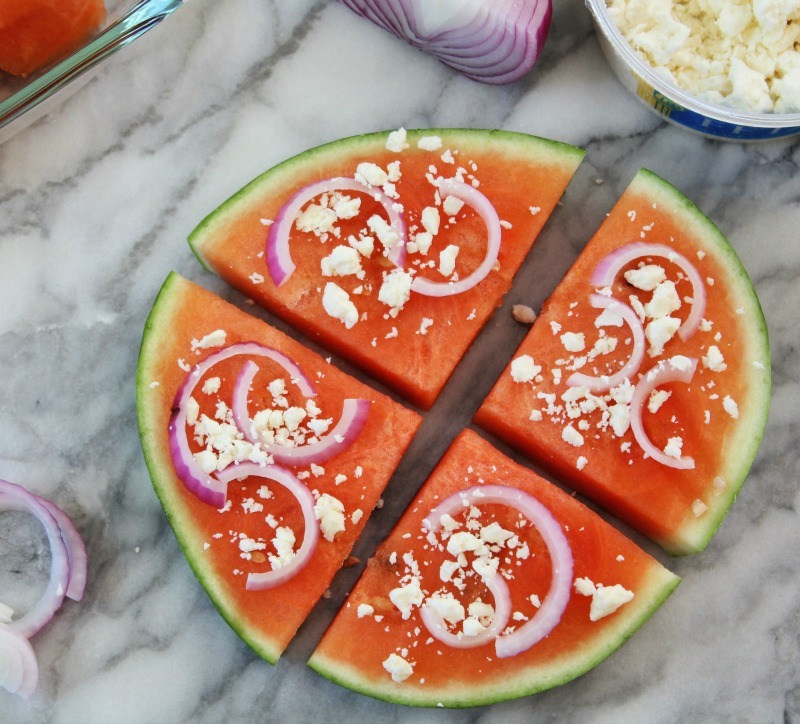 Lay the watermelon on a platter and cut into 4 slices. 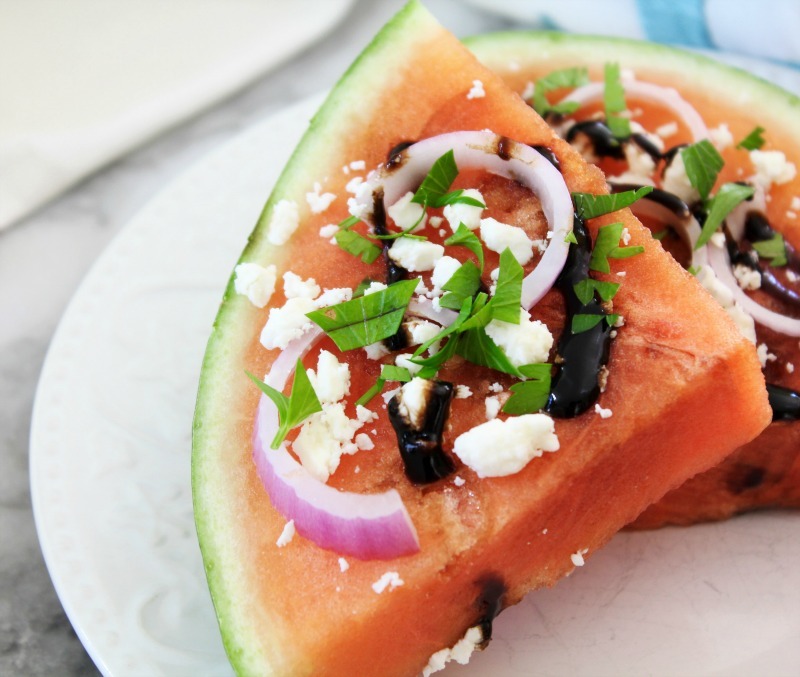 Top the watermelon with feta cheese, onion and drizzle with balsamic glaze. Sprinkle the watermelon with parsley. For a different variation, you can also cut the watermelon into cubes, and then add all of the remaining ingredients for a salad. I am having some major internet issues, and I have a few minutes to get this posted before I lose the internet again, so I am off. I’ve never seen this idea before, it looks amazing! Thank you so much!! It tastes so good, very impressed with this combination of flavor. S U M M E R is just around the corner! this is perfect!